Cities are made up of economic, political and cultural inputs, and forces that are exercised by capital (market), the state and ordinary citizens. When observed from above, it is easy to capture what capital and the state do to express the change. The state constructs and controls public spaces such as roads, parks, ports and infrastructure while capital creates high-rise complexes, malls and so on. What about the third group – the ordinary citizens? Also referred to as civil society, citizens comprise the largest and most diverse and complex group of actors among these three forces. They are not organised through formal structures like the state or market. Yet, as consumers, users and workers, they put into operation and bring meaning to all plans of the state and capital. My inspiration is Nihal Perera’s book People’s Spaces that explores ways in which ordinary citizens bring meaning to the social and physical spaces of the city. The book explores the silent and small ways in which citizens change (familiarise) space, while other dominant actors actively seek visibility through the importation of monumental architectural symbols of modernity from developed nations that are culturally, economically and environmentally distant to us. An example of the latter are the new high-roofed, expensive pola structures around the country that are not rain resistant. While there’s nothing wrong in being inspired by what happens in other parts of the globe, one should not overlook the modernity produced in this country by its own people. In view of understanding our spaces better, I investigated local spaces such as the handiya (junction) and pola. The Malabe and Kottawa polas that I studied helped me understand how the cityness in Greater Colombo is constructed, and the cultural capital and freedom the pola people use to build their own city. The Angaharuwada Pola in Kottawa began as a wholesale market in the 1920s. 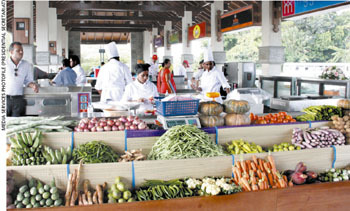 When Kottawa was transformed into a suburb of Greater Colombo, and the production of betel leaves and other agricultural products decreased, it reinvented itself as a retail pola. Now it provides vegetables, fruits, spices, grain and many other everyday items that are brought from other parts of the country and the world to its residents. And the creativity does not end there. During my three months of research (working for a snack vendor), I observed how the pola in Kottawa responds to increasing traffic following the office hours in Colombo. As the traffic worsens, customers take a longer time to reach the pola and so vendors have extended their times of operation. They have also developed their own mechanisms to light up the space. What does this creativity, assertiveness and resourcefulness tell us about city folk and the modernity they create? People are creative, so it is more efficient for the state and investors to tap into this energy than push them aside. If citizens remain passive recipients of the dreams of the nation, its leaders or investors, there will be no adaptive use or familiarisation of spaces. An intersection will not become a handiya, nor will there be a pola in the town centre. If all ‘informal’ or ‘irregular’ businesses disappear, the cities created by thousands of creative ventures and active socioeconomic spaces will be silenced. There will only be a sanitised and orderly city that is extremely expensive, predictable and boring. It is not a mere issue of aesthetics, but one of hunger and social unrest. The people who are not trained to fit into the structures that are produced by the state and market – or think in terms of mainstream large-scale businesses or projects – will become beggars or a burden to the so-called system. If this is not what we aspire to be, then it is time to value the third force: the cultural power of the citizenry that creates a cityness by extending its resourcefulness and creativity to the millions of interstices in the physical spaces and gaps in social spaces that are created by the two major actors. This is what sustains a city – taking care of the majority of its people whose lives are not being supported by mega projects that cannot be inclusive because they either aim at order and/or power. How could we maintain cityness without propagating poverty? This can take place only by considering the city’s people and what they produce to be a resource rather than a problem.